In four days it will officially be fall! For this second look with my fall partnership with Old Navy, I went with a playful prep look to officially welcome fall this week. Old Navy is one of my favorite places for denim because they have so many styles and colors. I saw these mustard colored ones and automatically thought fall foliage! I paired them with a striped long sleeve top and you guys already know the how I feel about stripes. I love the bell sleeve style on this top because it elevates the top and makes it go from plain to wow. Statment sleeves were a huge trend this summer and I'm happy to see them going into the next season. Of course, I can't say the word fall without hats and booties. These accessories were perfect to finish the look. There is currently a fall fashion sale going on at Old Navy until 9/21. Jeans are up to 50% off, tops starting at $8 and dresses starting at $15. Don't forget to #SayHi to #OldNavyStyle and catch this great sale for your fall fashion wardrobe! Happy almost fall! Hope you guys enjoyed this look! This post is sponsored by Old Navy. As always all opinions are my own. Thank you for supporting the brands that work with Patty's Kloset. I cannot wait for fall! Hands down my favorite weather to dress for! Omg mine too! I love fall fashion! I love the pictures, love the colors and the jeans are so beautiful! Denims are must have for fall season and 50% at old Navy , I need to take advantage of this fall fashion sale ! 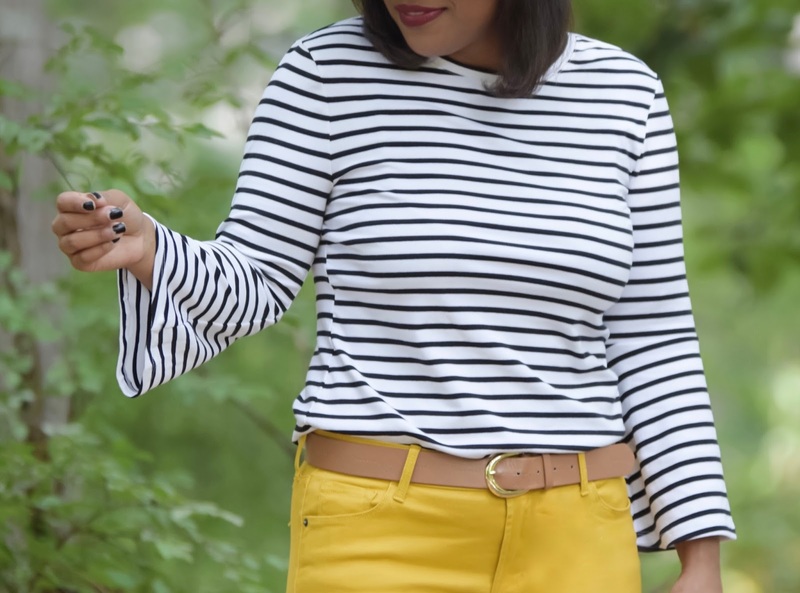 Love your Mustard Jeans paired with the striped top, real cute outfit. Thank you babe and yes 50% off! They have so many good stuff for fall! I love yellow with black and white stripes - so classic. You look beautiful! Absolutely love the hat! and you look fantastic ! your blog is great and so are all of the looks you create. I'm a new fan for sure! Those yellow pants are stunning on you!! I love this entire look! I love Old Navy! This makes me want a pair of mustard yellow pants so bad! I love this denim color! This is so cute! Love Fall and your striped top!